Kathleen Holland was born in 1879 at Bridgwater in Somerset, the daughter of William Thomas Holland and his wife nee Florence Du Val (1). In 1891 she was living with her parents and a Dutch governess. Her two elder sisters were by then married and in their own homes. She was the youngest of the three Holland sisters, and she too met yet another organic chemist. When her brother-in-law Frederic Stanley Kipping was at the Institute of Chemistry in London, her sister Lily Kipping told her that he had taken on a young Birmingham student, Arthur Lapworth. He played the viola at musical evenings organised by Mina Perkin, and he also played the violin. Kathleen Holland was herself a keen musician and played the cello. She eventually met the new student when Arthur Lapworth was invited by the Hollands to spend his summer vacation with them at their home, The Lions in Bridgwater. In 1898 Arthur Lapworth was appointed Professor of Chemistry in London, and the prospect of marriage dawned. However William Holland, father of the three sisters, became seriously ill, and died on 11 December 1899. Not until after the usual period of mourning could the wedding proceed, and Kathleen Holland and Arthur Lapworth were married in St Mary’s church in Bridgwater on 14 September 1900. They had no children. Arthur Lapworth was born on 10 October 1872 at Galashiels in Scotland, the son of geologist Charles Lapworth, the Professor of Geology at Birmingham University. After graduating from Mason College (later Birmingham University), he worked at the City and Guilds Institute in London and from 1895 at the School of Pharmacy, in the University of London and later at the Goldsmiths Institute. In 1909 he became Senior Lecturer in chemistry at the University of Manchester, and he was appointed Professor of Organic Chemistry there in 1913. He was elected a Fellow of the Royal Society in 1910, and was awarded their Davy Medal in 1931. He retired in 1935 and died in Manchester on 5 April 1941 (2). Kathleen Lapworth moved to Criccieth in North Wales to live with her sister Lily Kipping and her husband, but after a few years looked for a place of her own. She settled at Inglewood on Landscore Road in Teignmouth, Devon (3). She died at Teignmouth in 1960. 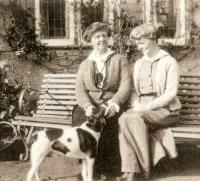 (1) An account of the life of the Holland family is given in The Holland Sisters by E.G. Rochow and E. Krahe (2001). This is a semi-fictionalised narrative that has been adversely criticised by William Brock in Chemistry and Industry dated 1 October 2002. But despite its fictional style, the book does but contains some factual information and photographs supplied by Brian Kipping, a descendant of Frederic Stanley Kipping and his wife nee Lilian Florence Holland. (2) For a full account of the career of Arthur Lapworth see the obituary by R. Robinson in the Journal of the Chemical Society (1947) pages 989 to 996. (3) The Holland Sisters by E.G. Rochow and E. Krahe (2001) page 178.